Want to do various of exercise in your own home? This home gym will be your best partner to help you keep health. 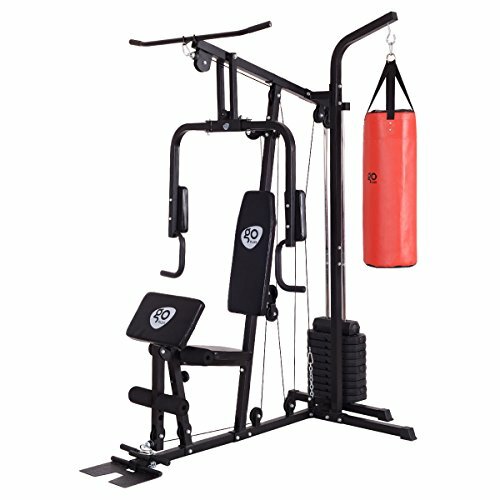 It features heavy duty frame and multi-functioning press arms for chest press and back exercises. The dual-function leg developer properly aligns with the knee joints for effective leg extensions and leg curls. The multi position high and low pulleys and cables are connected to an adjustable weight stacking for a smooth and controlled body exercises and hence no need to load and unload weight plates. Enjoy your boxing and release your body. Welcome! High quality with competitive price can be realized here! 100LB adjustable weight stack with lock allows you to do resistance training safely. Note: 10 levels adjustable and no need to stress about loading and unloading weight plates. Overall Dimensions: 45.5 " x 71.6 " x 86.6 "
1. Assembly Is Required According To Included Instruction. 3. Before Boxing, Please Consider The Weight Capacity And Fix The Frame First. Multiple Packages: This item have 4 packages for you, pls wait them patiently. If you have any quetsions, pls feel free to contact us. We will response your message within 24 hours, pls be assured about that.